Choosing the best jumper for baby boys and girls can be a difficult given the wide variety of choices available. The most important thing for any parent is to ensure that their precious little baby is safe at all times. You want to choose a jumper that will help with your baby’s development while also providing them with fun things to play with. To that end, we’ve spend literally hundreds of hours researching all the top brands so we could create the best baby jumper reviews to help you find the perfect choice for your infant. You’ll be pleased to know that we have very strict criteria when it comes to choosing any baby products and only the best of the best make our lists. We’re confident you’ll find the ideal jumper for your baby, with a wide variety of sensory stimulation and engaging toys to amuse and entertain your infant for hours on end! 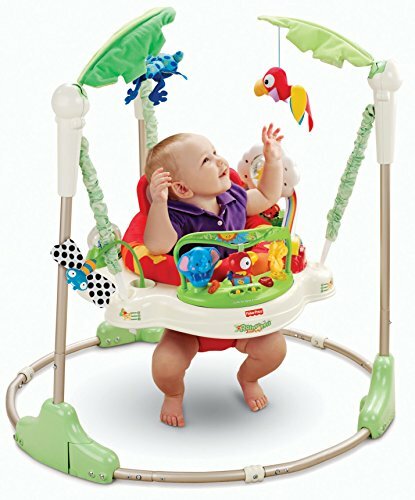 The Fisher Price Rainforest Jumperoo is a wonderful baby jumper that’s tons of fun for your baby and helps them with their developmental milestones. This jumperoo has a cute red spotted frog seat that has lots of padding for extra body and head support and the seat cover removes easily and is machine washable. The seat rotates 360 degrees and everywhere your little one turns, they’ll be treated to fun toys, and entertaining music, sounds and lights. 2 cute hanging toys – a blue frog and red bird – encourage your baby to reach up, bat at, and grasp. Down on the platform, there’s a colorful animal station with flashing lights, a blue bobbing elephant, a pretty red fish and a yellow swinging monkey. This is also where you’ll find the volume and sound control. There are 2 volume levels and you can set the sound for either continuous music or only sounds. Setting it at continuous music gives your baby 4 minutes of fun music and after the 4 minutes are up, your little one has to spin the spinner, jump, or move around in order for the music to start playing again. When you set it to only sounds, the only time your baby hears any sounds is when they make any kind of movement, such as jumping up and down or spinning around in the seat. This is a great way to teach cause and effect because your infant will quickly learn that they can control when the music or sounds start by jumping up and down or moving around. Other fun things for your baby include a blue butterfly with soft black and white wings (great for chewing and sucking on), a rattle lizard, a peek-a-boo tiger, and a drum spinner that makes noise when your baby turns it. This Fisher-Price jumper requires 3 X AA batteries (not included) to make the lights and music play, and holds a maximum weight of 25 pounds. It can be adjusted to 3 different height levels, allowing it to grow with your child. Parents find it easy to assemble and it folds for convenient storage and portability. As with any baby jumper, it’s recommended that your baby can hold their head up unassisted before they start using it. The Rainforest Jumperoo is a great way to help strengthen your baby’s leg muscles, getting them ready for standing on their own and walking. If you’re looking for a safe, durable fun jumper that doesn’t need to be set up in a doorway, then the Rainforest Jumperoo is definitely worth considering. It’s built to last and provides your baby with a wide variety of sensory stimulation. Lots of fun things for your baby to play with! Graco makes a number of high quality baby products, and this Graco Bumper Jumper Little Jungle is one of their more popular products. This doorway bumper jumper features a sturdy bounce spring and a safety cord to ensure your baby’s safety. The seat of this jumper is polyester with a machine washable seat pad and the straps are designed to not twist and tangle. Straps are height adjustable for your infant. Perfect for infants who weighs 25 pounds or less, this bumper jumper is easy to get your baby in and out of, and the door clamp is mark free. It comes with a handy toy tray and 2 soft removable toys with adjustable play rings to help keep your child occupied and having fun. The toy tray provides extra protection if your child is a good jumper, since it prevents them from running into a door. Just to let you know that your baby needs to be able to hold his or her head up on their own without assistance before placing them in any baby jumper. Extremely well made and sturdy, this gorgeous jumper will hold up under all the jumping your baby can do, as long as they don’t exceed the weight capacity. If you are looking for a good bumper jumper that will occupy your baby so that you can get a few chores done, then the Graco Doorway Bumper Jumper may be well worth considering. Your baby will have a blast and loads of fun using this jumper! 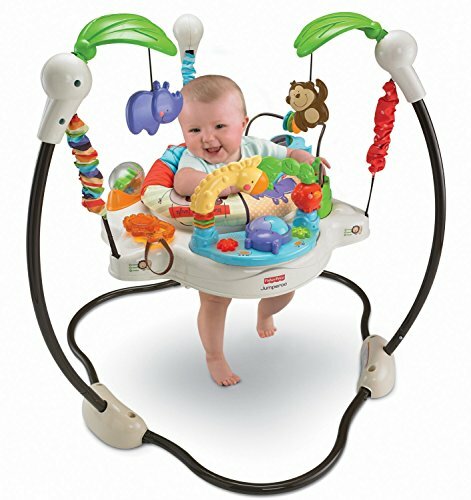 The Fisher Price LUV U Zoo Jumperoo is a stand alone jumper that doesn’t need to be put up in a doorway. This jumper is made from metal, plastic, and polyester, and features music, animal sounds, and lights that start and work as baby jumps. A steel frame with non-slip footings help to keep your baby safe as they jump and bounce around. You’ll need 3 AA batteries for your infant to enjoy the sound effects. The seat spins at 360 degrees, and there are toys all around the seat so that everywhere your baby turns, there are toys for them to play with. Some of the toys consist of a bright colored bird, a monkey, and elephant, a hippo and a giraffe. This seat adjusts to 3 different heights. The springs on this jumper are covered with soft material, which keeps your baby’s fingers from being pinched. The Luv U Zoo Jumperoo toys offer an opportunity for your baby to explore different textures, shapes, and colors. Built for children who weigh 25 pounds or less, it’s important to note that your baby does need to be able to hold their head up without any assistance to use this jumperoo safely. This jumper is easy to assemble and most parents find it only takes a few minutes to get it set up and ready for their baby to enjoy. Not only can your baby have a lot of fun jumping and bouncing in the jumper, it also offers your infant plenty of toys to play with while exploring shapes and textures. It’s easy to adjust the height of this jumperoo so it will grow with your child over several months. Some parents do state that the lowest setting may be too high for smaller babies, but they solve the problem by placing a pillow under the jumper so that their infant can still jump. Using their legs to bounce helps to strengthen the muscles in your child’s legs, helping them get ready for walking when they are old enough. Some babies even use the jumper to simply stand still for short periods of time. As your baby jumps up and down or plays with certain toys, sounds, music and lights are activated, teaching your child that certain effects will occur when they do certain things. This Fisher-Price Luv U Zoo Jumper is really sturdy and well made and should outlast your baby’s need for a jumper. If you are looking for a fun toy to keep your baby occupied for fairly long periods of time, then this LUV U Zoo Jumper just may be the ideal toy for your infant. 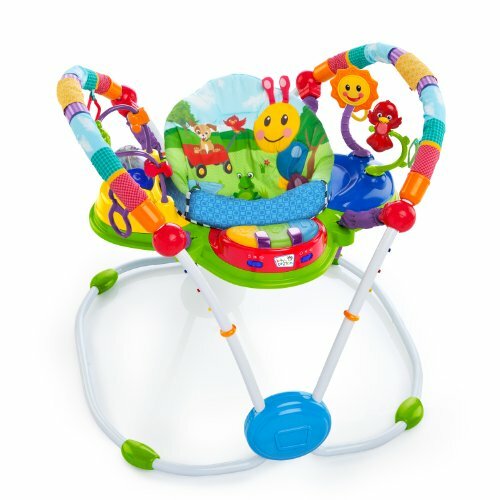 The Evenflo ExerSaucer Jump and Learn Stationary Jumper Jam Session offers your baby a safe place to play and have fun. Features include lots of age appropriate interactive toys, lights, and 3 different kinds of music. The seat bounces to help strengthen your baby’s legs and prepare them for standing and walking. It also has a rocking motion and swivels 360 degrees. Toys can be removed so that your baby can play with them during tummy time or once they outgrow the jumper itself. It adjusts to three different heights so that your infant can use the Jam Session baby jumper from the time they can hold their head up on their own until they begin walking. The surface is easy to clean and the removable seat cover is machine washable. The recommended maximum weight limit is around 24 or 25 pounds, and it requires 12 AAA batteries to operate (not included). Babies just love bouncing to the music! This special edition Baby Einstein Neighborhood Friends Activity Jumper includes a seat that features a puppy, frog, bird and a happy face. The vibrant colors used in this jumper help to gain your infant’s attention and to hold it for long periods of times. The seat rotates 360 degrees with 4 activity stations, so everywhere your baby turns, they have new toys to play with and new things to learn. One station has a piano that activates lights, music and learning words in English, French and Spanish. Your infant will also love playing with the jumper toys including a spinning frog, the spinning rattle drum, the flowers, birdie and much more! The different activity stations provide your child with a lot of entertainment and stimulation. Many parents told us that their infant will play in this jumper for 30 minutes to an hour, allowing them to attend chores or actually eat a meal. Children quickly begin to learn that certain actions on their part can gain certain results. For example, hitting a piano key will play music or start the lights or produce sounds. Infants seem to like knowing that they can create change in their environment by their own actions. This Neighborhood Friends jumper adjusts to 5 different heights so that it can accommodate your child as they grow. It’s suitable for children 25 pounds and under and takes 3 X AA batteries. The battery life is about 20 hours. You also get some additional links so that you can add extra toys to keep your child’s interest. One thing worth nothing is that you do need to wait until your baby can hold his head up unassisted before using this or any other jumper. This Baby Einstein jumper is easy to assemble, even for people who are not good at putting things together. It’s extremely well built and durable, and will certainly last until your child outgrows it. Perfecting for helping your child strengthen the muscles in their legs which helps prepare them for standing and walking on their own, it’s a really fun toy activity center. It’s sure to keep your baby happily playing and learning for fairly long periods of time, giving you brief periods of time to complete much needed small chores or an opportunity to relax for short periods of time. The Fisher Price Discover ‘N Grow Jumperoo is a stand alone jumper that is designed to allows your child to turn, bounce, and play all in place! With fun objects to bat at and grasp, a roller ball, beads, a clicker, lights, sounds, and more, there’s no shortage of things for your little one to explore. There’s even a little piano keyboard that lights up and makes music when your baby plays it. A comfortable seat rotates 360 degrees allowing your baby to reach all the toys and activities. The toys and the seat cover are all removable and machine washable and the legs are foldable for convenient storage when not in use. The Discover and Grow is a free standing baby jumper with a sturdy steel frame and soft spring covers to help prevent little fingers from getting pinched. 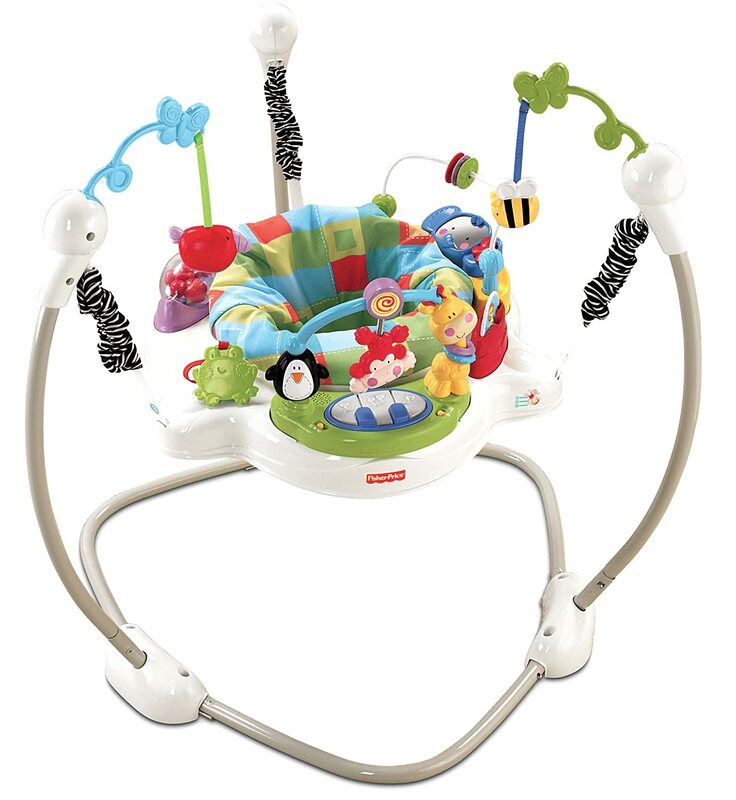 The recommended maximum weight capacity of the Jumperoo is 25 pounds, with a max height recommendation of 32″. It has 3 height adjustments which allow it to grow with your child. 3 AA batteries are required (not included) and it’s recommended that your baby should have the neck strength to hold their head up well on their own before you start using it. The Discover and Grow is a a wonderful way to keep your baby entertained while you get some things done, and it will provide your baby with hours of fun discovery and entertainment! Tons of fun for your baby! An alternative to doorway jumpers and those stand alone jumpers with surround toys is this Jolly Jumper On A Stand. It’s a simple jumper that allows your infant to exercise their legs and have fun without the need for other entertainment. This jumper is great for homes with smaller spaces since it doesn’t take up a lot of room and it’s extremely easy to transport for both indoor and outdoor use. Plus it can be easily taken down and stored when not in use. The Jolly Jumper is easy to assemble and most parents said it only takes a few minutes to have it up and ready for their baby to bounce around in. Several parents shared that it has a really great bounce and their kids love it! It’s designed to help your infant begin to improve their balance, which is important when learning to stand alone and take their first steps. In addition, it also allows your child to bounce up down and even stand, helping them strengthen their leg muscles and preparing them for standing on their own and walking. When set up this, this baby jolly jumper measures about 31″ wide X 51″ high and has a maximum weight capacity of 28 pounds. Only babies that can hold their head up with full neck support should use this jumper. The chain is super strong and can be adjusted to different heights, allowing this jumper to grow with your child. The sturdy seat harness provides strong support for your baby’s spine, which helps strengthen their posture. This Jolly Jumper is sure to give your baby hours of entertainment. And for even more fun, put on some music and watch your baby go! Babies love bouncing around in this jumper! The Evenflo ExerSaucer Jump And Learn Jumper Jungle Quest allows your baby to go on safari without ever leaving the comfort of your home! This fun jumper is a safe, stationary play area that surrounds your baby with stimulating, interactive toys, lights and sounds, while allowing them to exercise their little legs. One of the nicest things about this jumper is that all the parts are very flexible and easy for your infant to pull on and play with. The soft, flexible toys respond to your infant’s touch by making fun sounds and lighting up. There’s an elephant that makes an actual elephant sound when your baby turns it, a cute little mouse that moves like it’s chasing a piece of cheese, and a book that plays music when the pages are turned. There’s also a delightful giraffe with sliding rings on its neck, a soft hanging monkey that velcros on and off, and a hippo with colorful fish in its tummy that make a noise when your baby turns it. 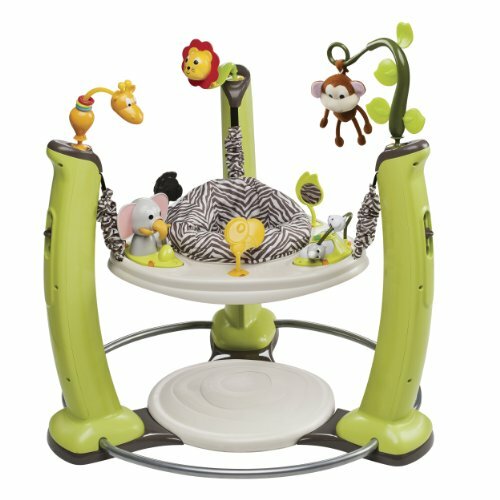 In addition to all of that, this Evenflo ExerSaucer also 3 soft teethers: a green leaf with a mirror on the back of it, a black zebra and a yellow toucan. Not only are the teethers soft to bite on, they’re also really flexible so they’re super easy for your baby to get to their mouth. Another great feature is the unique soft balance foot pad that provides great bouncing action and eliminates the need for you to put anything under your baby’s feet for them to stand on. The comfortable seat turns 360 degrees, allowing your child to easily reach all the fun toys. Plus all the toys are ‘take with me’, so they can be taken off and moved around or played with even when your baby’s not in the jumper. Being able to put different toys in different places keeps things fresh for your infant and allows you to give them a different playtime experience on a regular basis. It also makes changing the batteries really easy. 3 different height adjustments ensure this jumper will grow with your child and it requires 6 AAA batteries to work (not included). Designed for babies who are able to hold their head up by themselves, the Jungle Quest is an awesome baby jumper with lots of textures, shapes, and colors for your little one to explore and discover! Babies have tons of fun playing in it! If you are looking for a toy that your baby will love and enjoy, then the Baby Einstein Neptune’s Ocean Discovery Jumper may the perfect choice. This gorgeous Neptune’s Ocean Jumper consists of a removable electronic turtle that produces lights, sound and introduces numbers and colors in 3 different languages. It also comes with a crab spinner ball, an octopus paddle, a starfish mirror and cloth pictures of sea life, as well as a cute little yellow and white striped fish. This beautiful jumper has 4 height adjustable positions and a 360 degree rotating seat. It is designed for infants 25 pounds and under, needs 3 X AA batteries, and is a highly interactive jumper. It provides your child with a lot of entertainment everywhere they turn. Parents said that their infants tend to use this jumper longer than any other interactive toys they possess. It’s lightweight and easy to move from room to room so that your child can play while keeping you in sight while you are getting those small chores done. This Ocean Discovery Jumper is extremely sturdy and well built and should hold up well until after your child out grows it. All the bouncing helps develop your infant’s leg strength preparing them for standing and taking their first step. This is a fun jumper toy for your infant that keeps them entertained and provides them with exercise for several months. For safety reasons, this jumper should not be used until your child can hold up their head unassisted. 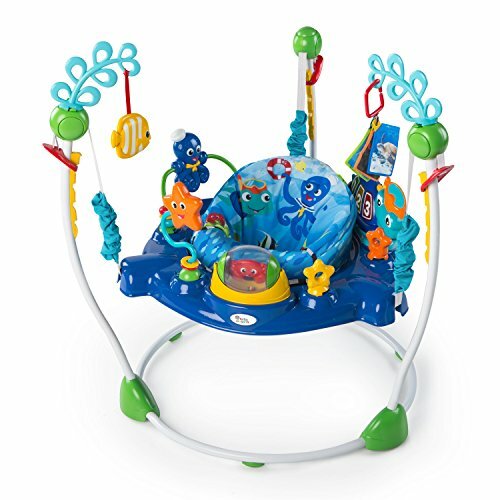 Babies love this ocean themed jumper and all the cool toys that come with it! 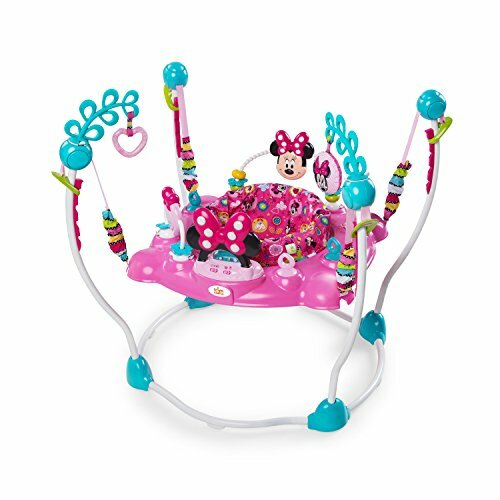 This wonderful Disney Baby Minnie Mouse PeekABoo Activity Jumper is ideal for babies who are ready to grasp toys and explore the world around them! With over 12 engaging activities plus lights and sounds that activate when your little girl jumps, she’s sure to find this adorable jumper fascinating and fun. There are 2 volume options and a spinning ball, heart shaped mirror, tactile leaf stalk and more will keep her captivated while bouncing away happily. It also has 4 adjustable height positions and the comfortable seat rotates 360 degrees to ensure your baby can reach all the toys and explore all the different activities. 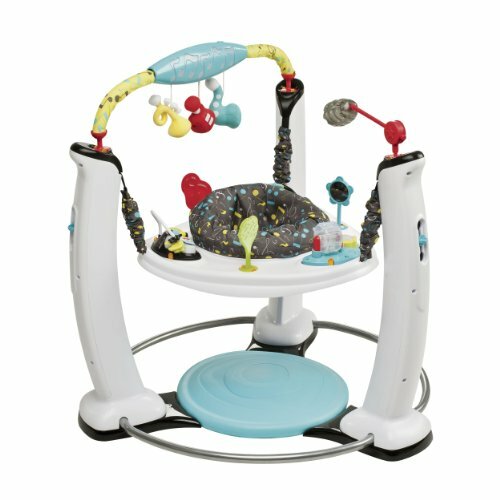 There’s a built in toy tray and several link loops so you can attach your infant’s other favorite toys for even more jumping fun. It requires 2 AA batteries (not included), is recommended for children weighing 24 pounds or less and has a machine washable seat cover. Designed for babies who can sit up with some assistance and hold their heads up unassisted, this Minnie Mouse PeekABoo Jumper is a great little free standing jumper. It’s sure to provide your infant plenty of fun, stimulation and learning!